Los Angeles in the year 2028. The privatisation of water companies has led to city-wide rioting. A criminal’s brother is shot while escaping a botched bank job. They head to a secret hospital for felons run up on the penthouse floor of the once-sophisticated but now dilapidated Hotel Artemis. It’s private wards – of which we only see four – have art deco detailing. They’ve been fitted with hi-tech diagnostic equipment, robotic surgery and a rather neat 3D organ printer. A very apt premise for Northern Ireland audiences given the domestic hosepipe ban and the NHS70 celebrations! Jodie Foster plays the 70-year-old struck-off doctor who hasn’t stepped outside her highly secure ward for over 20 years. ‘Nurse’ is somewhat of a benign Miss Hannigan (from Annie) who drinks to manage the pain of the memory of her son’s death while caring for the vulnerable (like a modern-day Greek God Artemis). Walking up and down the green-wallpapered corridors with a very particular gait, she responds to medical situations flagged up on her ever-present tablet computer. Foster plays the most colourful character in the script. The rest of the ensemble cast for a long time strangely feel like they have fallen out of a Cluedo film. Sterling K. Brown plays the mastermind whose injured brother has been checked into the Waikiki suite. 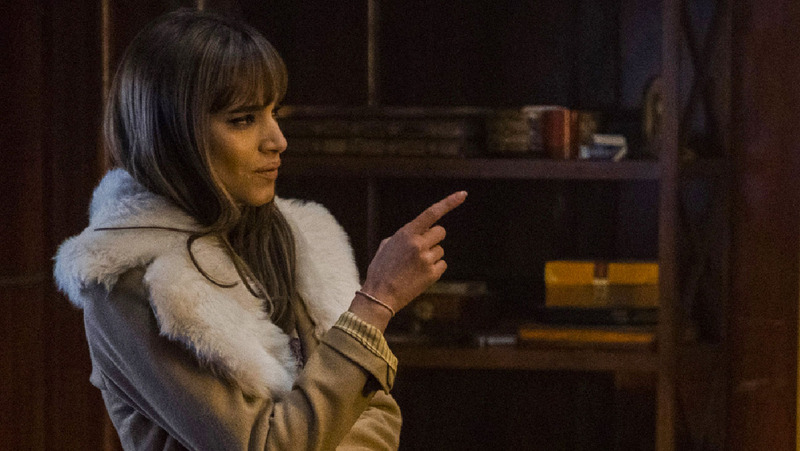 Up the corridor in the Nice suite, silent assassin Sofia Boutella is recovering from a simple bullet wound. Arms dealer Charlie Day provides the comedy in Acapulco, while a character played by Jeff Goldblum is being rushed in to take up the last room. 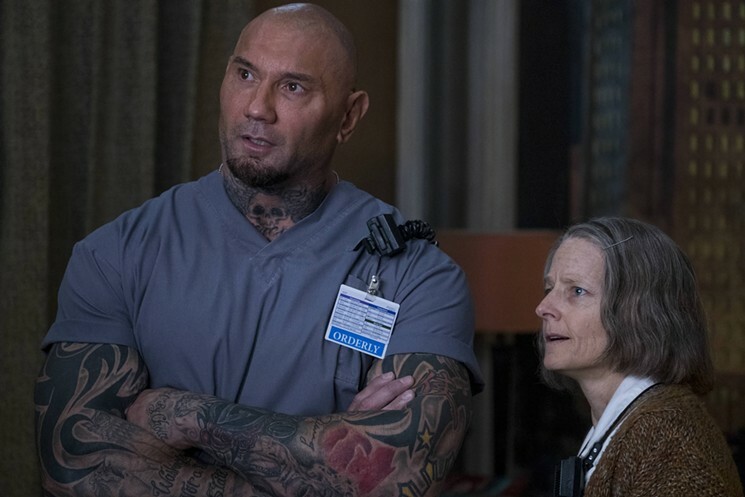 The overworked hero of the piece is Orderly Dave Bautista who doubles up as security, building maintenance and medical assistant. It’s a story of physical and mental hiding and escape for Foster and Brown’s characters. The external world’s demons continue to haunt them when inside the prison-like hospital. Redemption requires a degree of unshackling and stepping out into the unknown to taste the new dawn. In a better film, it could have been tolerably clichéd. Instead, the vital signs of Hotel Artemis remain flat. The film’s first half is its best. It is writer Drew Pearce’s first time in the director’s seat and he is to be applauded for hiding lots of detail from the audience and allowing their list of questions to merrily stack up unanswered for a long time, adding to the feeling of mystery and satisfying revelation as the answers are finally revealed at just the right time. However, this level of control does not extend to all aspects of the film. Some plot points are so well signposted – labelled in the case of the power outlets – that they lessen the fulfilment and weaken what could have been a much better neo-noir film. Zachary Quinto’s character is one dimensional and his phalanx of henchmen are wordlessly brawnful. And aspects of the dialogue are repetitive to the point of irritation. The medley of hand-to-hand killing provides an ending that well befits the mood of the 94-minute movie which is surprisingly generous in the fate provided for its main characters. 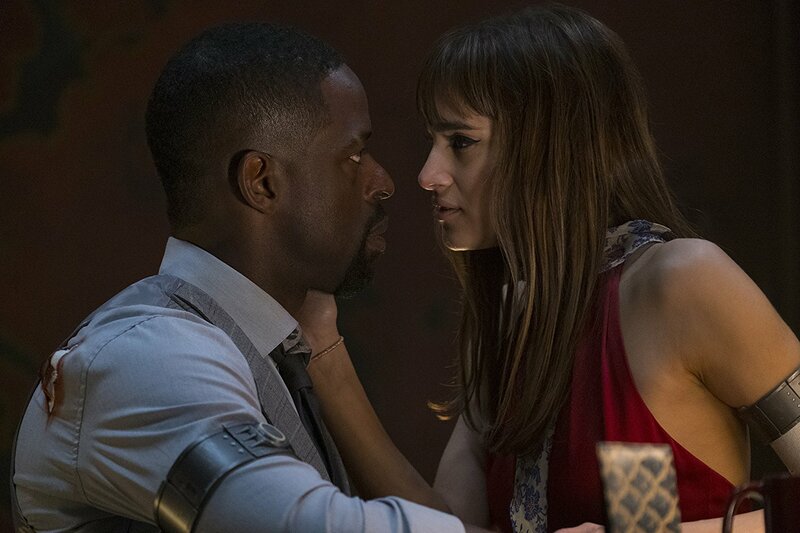 Hotel Artemis is released on Friday July 20 across the UK and Ireland and is being screened at Movie House cinemas.